Cooking a meal in your kitchen requires sweat, effort and lots of love so you should definitely have a beautiful kitchen that you will enjoy. One important element that you should take note of is the countertop where you will do your food prep and many other activities so it should be something that you like. These countertops are stylish and functional so be prepared to be amazed. This is a really cool and futuristic design that will simply awe anyone that sees your kitchen countertop. It will help in your food prep as you can really see what you are doing as well. Go one step further and light up the ends of your cupboard for a cohesive look. If you are looking for something durable that can last you a long, long time then go for stainless steel. It is resistant to almost anything and as it is non-porous, you can keep it clean easily. 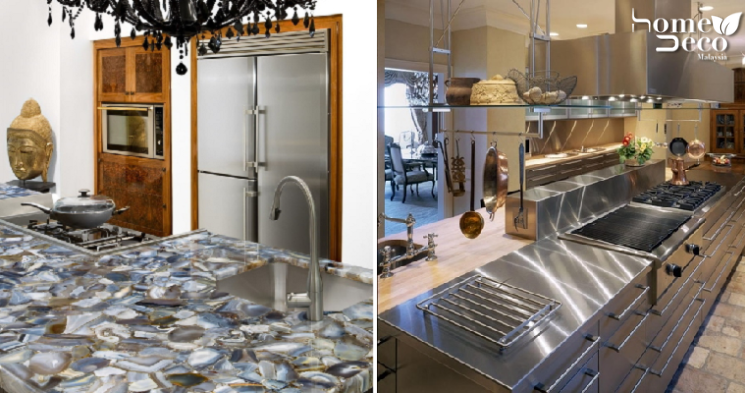 Stainless steel kitchen countertops also make a great modern look that is tailored and elegant. Using wood in the kitchen makes it look more homey and warm plus with this rustic looking countertop, you will definitely attract attention. It also makes a good focal point in the room for a really chic look. Don’t be afraid to use concrete in your kitchen as it creates a really modern and minimalist look but if you want something a bit more refined, choose polished concrete instead. Pair it with some natural wood accents to make it look warmer. This is a seriously beautiful kitchen countertop that looks both grand and posh in any kitchen. It is a natural material that will make it a delight to work with when you are cooking in the kitchen.